We love to see your results! #LIVEcolour on Instagram or share your pics with us on our Facebook page for the chance to appear on our website. LIVE’s Intense Colour + Lift range is specially designed to gently lighten and add colour in one step. 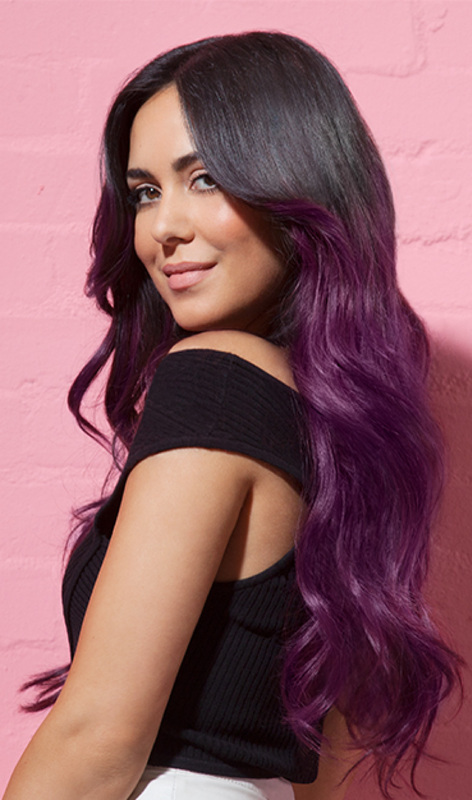 Available in 2 shades: Ultra Violet L76 and Luminous Brown L54. LIVE’s Intense Colour range also features many shades suitable for hair that is medium brown or darker including:Mystic Violet 087, Red Passion 043, Deep Black 099 and Cosmic Blue 090. Don’t forget to check the application range on the back of the box or on the product pages of our website to make sure the shade’s suitable for your natural hair colour. LIVE’s Intense Lightener range offers lightening of up to 8 or 9 levels (Absolute Platinum 00A and Max Blonde 00B respectively). After lightening, you may want to use a hair toner like LIVE Colour Refresher for Cool Blondes to neutralise residual yellow tones. LIVE’s semi-permanent Ultra Brights or Pastel range and LIVE’s temporary Pastel Sprays can be used on darker hair that has been pre-lightened (bleached). For the best pastel results, hair needs to be extra light blonde – this is especially the case for green and blue toned colours. For Ultra Brights reds, purples and pinks, you can achieve vibrant results on light to medium blonde hair. We recommend performing a strand test before colouring. If your hair is already dyed or bleached please contact our Schwarzkopf Advisory Service on 0800 328 9214 or email consumer.advisory@henkel.com for further advice before using a different permanent shade.